We would like to thank our guest, Keoni Lee, for providing the time lapse video footage of his trip on the Green River with guide Jeff Judkins. The Green River was BIG, but the fishing proved to be absolutely outstanding! Thanks Keoni and we look forward to seeing you again. Dubois, Wyoming Fishing Report: We have been very busy this past month guiding across Northwestern Wyoming on all of our guidable rivers and streams hence the lack of current reports. Fishing in Dubois, Wyoming on the tributaries and surrounding area of the Wind River have been fishing well. Rivers and streams are still fairly high, but completely manageable now. The dry fly fishing has been very consistent since July and the Wind River is slowly clearing up from the landslide. There is a chance it may be clear in the upcoming months. The Wind is fishable now, but not gin clear like it normally is this time of year. Bighorn River: Thermopolis, Wyoming Fishing Report: The Bighorn River is currently flowing at around 2200 cfs and still a bit off color. Fish still seem to be a bit confused and scattered at times due to the high water flows we have had. With that said we are catching nice fish on each trip albeit slow between fish at times. The fishing will improve as the temperatures start to cool off and fall sets in. We absolutely love fall fly fishing on the Bighorn River. Keep posted as we have several trips going out the rest of the week. Green River: Fontenelle, Wyoming Fishing Report: The Green River in Fontenelle is currently flowing at 1490 cfs. We have had a great spring and summer with guests on the Green with some big trout brought to the boat. Weather is hot right now and can slow down the fishing a bit, but with cooler temperatures the fishing has been good. We have several boats going out this week on the Green River so keep posted for more to come. 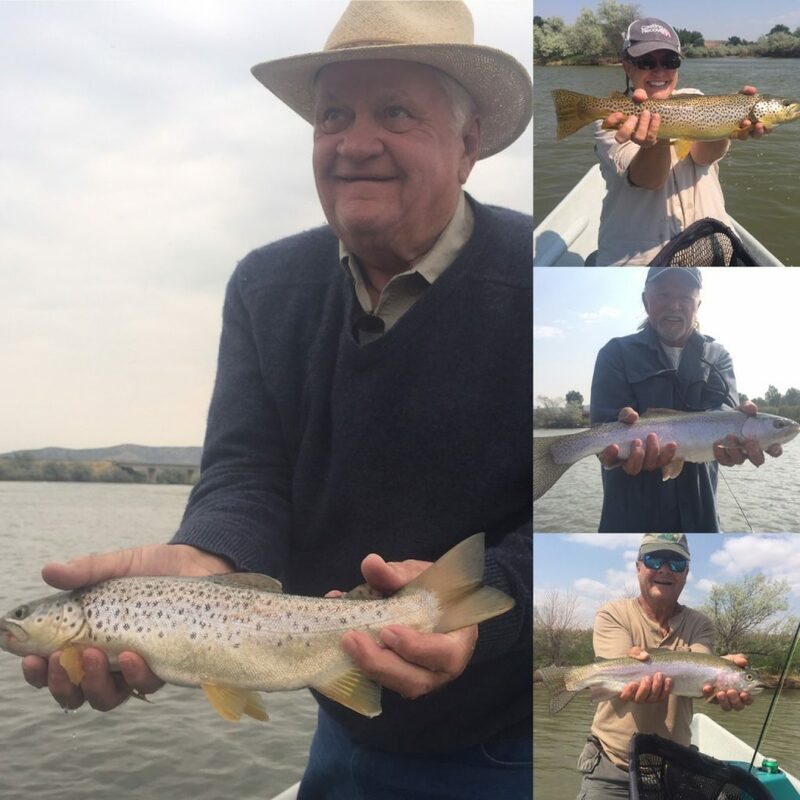 Bighorn River Fishing Report: Dunoir Fishing Adventures guides have been busy fishing the Bighorn and dialing in spring conditions. We have been doing our best not to fish to spawning rainbows by fishing deep runs and banging the banks with streamers. The streamer bite for nice brown trout has been on! 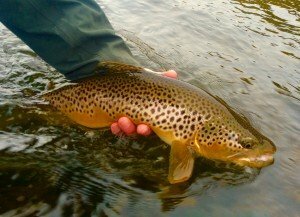 In the right conditions trout are feeding up top, keying in on midges and the occasional blue wing (still a tad early for bwo’s). Wedding of the Waters was extremely crowded this weekend making parking and unloading a boat a test in patience. Our guides decided to fish other options and found plenty of good water and satisfying runs to keep any angler happy. On a different note, the ice is starting to come off area lakes and the fishing is always phenomenal when that happens. 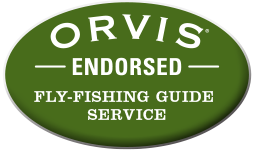 If you are looking for a completely different fly fishing experience, try our guided lake fly fishing trips from a boat. 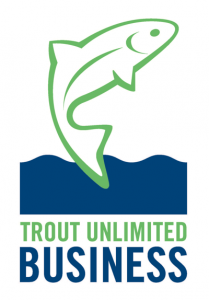 We will put you on big trout and keep you moving…just like the trout. Check more photos out on our Facebook Page. 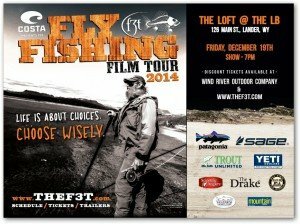 Lander is the first stop on the Fly Fishing Film Tour this season! Come down to the Loft at the Lander Bar this Friday to watch some amazing fly fishing films from around the world. All proceeds will benefit local cold water projects sponsored by the Popo Agie Anglers. Dunoir Fishing Adventures’ guides are looking forward to these great films, helping support our local fisheries, and seeing many of our good fishing friends down at the Loft. We hope to see you there this Friday. It is the perfect way to kick off the holiday season, so come and support a good cause!